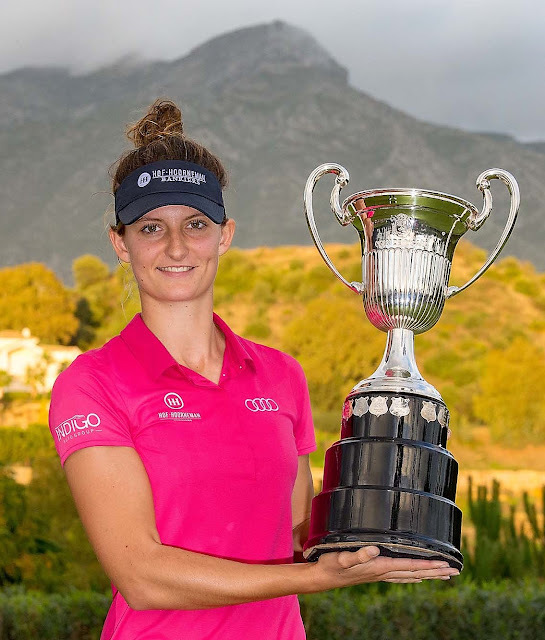 LPGA Tour rookie Anne Van Dam from the Netherlands successfully wrapped up 2018 on the Ladies European Tour by claiming her second victory on Spanish soil this season at the Andalucía Costa del Sol Open de España Femenino. The powerful hitter, who won the Estrella Damm Mediterranean Ladies Open in Sitges two months ago, fired rounds of 68, 67, 66 and 70 for a total of 13-under-par 271 at La Quinta Golf Resort in Benahavís, Marbella. The 23-year-old from Arnhem had been in possession of a three-stroke lead when darkness forced play to be suspended overnight. She powered into a four-stroke lead following the completion of the third round on Sunday morning, carding three birdies in her last five holes, but then, in the final round, the 2016 and 2017 champion, Azahara Muñoz, did her best to catch her. Muñoz gave Van Dam a scare when she closed the gap to two strokes, courtesy of four birdies in six holes on the back nine, but a double bogey at the short 16th, where she lost her ball down a rocky slope beyond the green, halted her challenge. Munoz took second place at 10-under-par after a final round 69. North Berwick's Catriona Matthew finished four strokes further back at six-under-par, one ahead of Spain’s Natalia Escuriola Martinez and Germany’s Olivia Cowan. England’s Hannah Burke and Spain’s Luna Sobron were a shot further back in a tie for sixth place. Finland’s Krista Bakker and Spain’s Marta Sanz Barrio secured their Ladies European Tour cards for 2019 with a share of eighth place. Georgia Hall finished in a tie for 10th place with last year’s rookie of the year, Camille Chevalier, and the Ricoh Women’s British Open champion collected her second consecutive Order of Merit title, becoming the youngest ever to do so. It was another brilliant performance from Van Dam, who finished second on the Order of Merit and collected a first prize of 45,000 euros. After a pair of birdies on the fourth and sixth holes, she was six strokes clear at the turn. A run of seven pars on the back nine, followed by just one three-putt bogey on the 17th and a regulation par on the short par-4 18th proved more than enough to earn her third Ladies European Tour title. She said: “I don’t know what it is about Spain, but I like it. It was tricky weather all week and it was difficult approaching the greens, with the amount of spin I had. Muñoz, who had birdied the first two holes in the final round, only to drop shots at the fifth and ninth, made a charge, but it was a costly mistake at the 16th, where she hit a hybrid club long and then had to go back to the tee. “It’s a little bittersweet at the end, but I gave myself a chance. I was six back at the turn and I was only two back with three to go. I had to be aggressive and I probably chose the wrong club, but I wanted to make a birdie and I don’t regret it,” she said. The 2019 European Solheim Cup captain Matthew, who played with Van Dam for the final two rounds, will be keeping a close eye on her over the next nine months leading up to the next contest at Gleneagles.